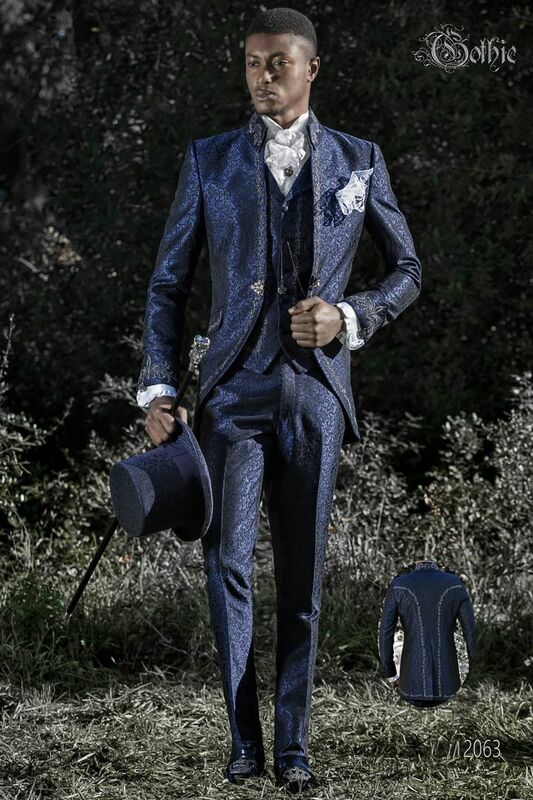 Blue brocade baroque luxury groom suit with silver-black embroidery on the front side and the back side. Napoleon collar... Blue brocade baroque luxury groom suit with silver-black embroidery on the front side and the back side. Napoleon collar with patterned buttons, 1 single vent at the back with Redingote-style seams, flap pockets, rhinestone frog closure and embroidered cuffs on the sleeves. Waistcoat with lapel made from brocade blue fabric with embroidery. Blue brocade waistcoat with vintage Baroque lapel. 5 covered tonal buttons and 2 double welt pockets. Black and Silver f... Blue brocade waistcoat with vintage Baroque lapel. 5 covered tonal buttons and 2 double welt pockets. Black and Silver floral embroidery on the front and back lining with elastic band to adjust width. Scarf and handkerchief set made from white floral lace.